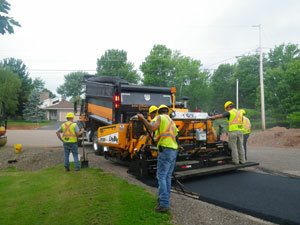 Asphalt Paving | Will Kare Paving & Contracting Ltd.
Will-Kare Paving and Contracting Limited has specialized in the residential and commercial paving market since its inception in 1974. Nearly half of our staff have been with us for more than 10 years, with several employees having over 20 years of service. This has helped ensure quality work while maintaining that personal touch and special care often desired by our clients. Our state of the art equipment helps to assure quality and reliability. In addition to our extensive client job portfolio, there are many features you will find at Will-Kare that you will not find elsewhere. We firmly stand behind our one year warranty, a sure sign that we are confident in the work we do and will rectify any concerns or problems with our work. 5 Things to Consider when Choosing a Paving Contractor. Does the contractor have the necessary equipment to do a quality job or is it done by hand? Is the contractor able to supply names and references? Is the contractor registered with the Better Business Bureau? Do they guarantee their work? Don’t be fooled by long term guarantees. Important considerations in receiving a quality job. Make sure the driveway has sufficient gravel under it. We like to see 12″ minimum; and commercial jobs should have 18″. More gravel is always better than less. 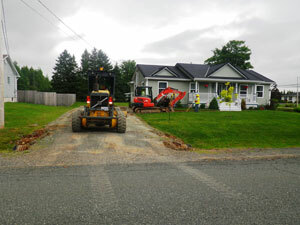 If the driveway is soft, this poor material should be excavated before new gravel is placed. 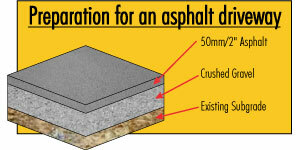 Remember asphalt should not be placed on unstable material. Drainage is vital on all work. Water should run away from a foundation. If this doesn’t exist, high spots should be lowered or additional gravel placed to raise the grade. The asphalt thickness on a driveway should be a minimum of 2″ rolled with commercial work being thicker (usually 2 ½” – 3″). Be sure the thickness quoted is after it is rolled out as it can vary ½” or more. Don’t be fooled by the thickness of a hand tamped edge as it gives the appearance that the asphalt is thicker than it really is. If you want to check thickness, hammer a spike through the surface and measure it. When recapping or paving over an existing surface, remember the condition of the existing asphalt determines the longevity of the second lift. 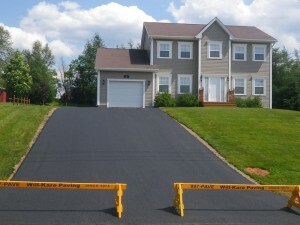 If crackage is excessive, the broken asphalt should be excavated first and patched before the second lift is applied. There are some driveways that cannot be recapped.